Opening times for 2015: We are open from 10am until 6pm BST (March 29th – Oct 25th inclusive) and 10am until 4.30pm during GMT every day. Last admissions are an hour before closing. The Park and Underwater World are fully open. The restaurant is fully open including take out refreshments. 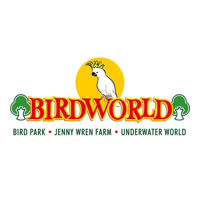 Give your children a party with a difference – book a Birdworld Penguin Party and enjoy all the fun of the park – included in the price. A birthday tea is a buffet typically consisting of fresh fruit, cheese cubes, salad, sausages, sandwiches (egg, ham, cheese, tuna), crisps, party cakes and icy lollies. A Hot meal typically consists of either chicken nuggets, chips and beans, or sausages, chips and beans. Vegetarian sausages are also available on request. Personalised birthday cake. £10.00 each. (Serves 12 people). Personalised birthday cake. £20.00 each. (Serves 24 people). Penguin Feeding. For a REALLY special birthday treat, why not join our bird keepers to feed the penguins. For £29.95 (normally £39.95) the price includes feeding, going behind the scenes, a penguin gift box and a certificate. (Penguin feeding is only available for 7 years old and over). Call us on 01420 22992 for availability or complete the form below.